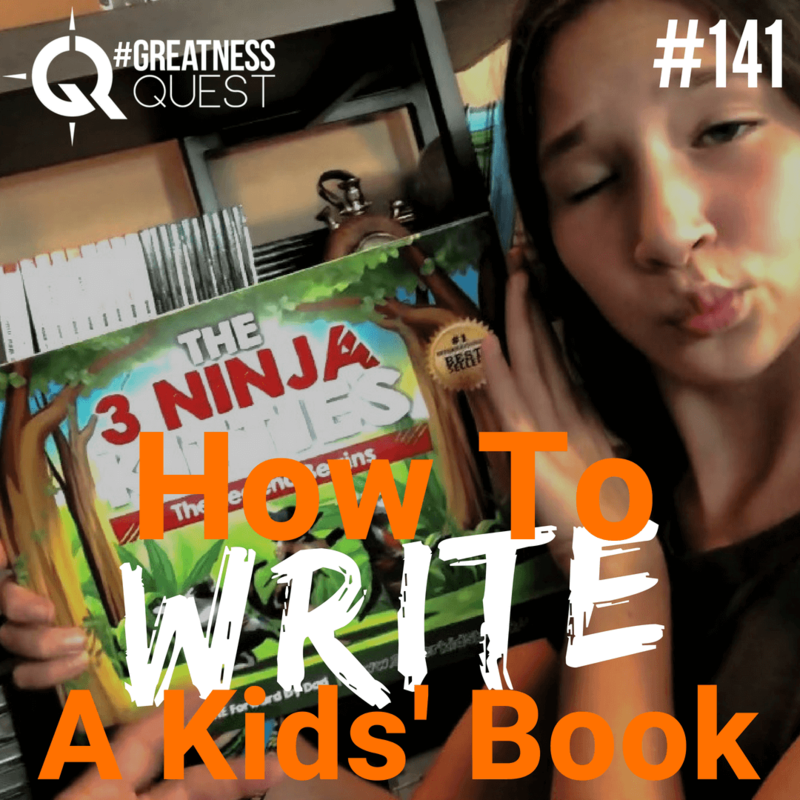 In today’s episode, I talk about HOW TO WRITE A SUPER KIDS’ BOOK. Kids have a very creative imagination and given the right push, we can help them write their own book and capture their imagination forever. I share some tips on what I did to help my 11-year old daughter become a 10x #1 bestselling author. Do you know a SUPER KID? Or, do you have a SUPER KID inside of you? How would you like to write a SUPER KIDS’ book, and capture their imagination FOREVER? Reach out TO ME and ASK for help with kids’ book stuffs. If you do, I’ll give you a SPECIAL INVITATION to one of our next workshops. Then we can help you and your kids write a book, publish a book, and you get to capture your kids imagination forever. Reach out to me on social media or shoot me an email at ​support@trevorcrane.com​. Welcome to another daily dose of greatness quest. Today’s episode is about writing kids books. I’m gonna help you with writing a super kids book today and to probably only tune in to today’s episode if you want to hear awesomeness about super kids book workshops, but also how you can specifically take what I’m going to share with you today and write a kids book, write and publish. I think you’re gonna love the show. Okay, welcome back. So I just finished another workshop with my daughter. We have been teaching kids and their parents how to write books, how to publish their stories, how to write great stories, and it’s getting really fun. I’ve done this with my daughter now for her with her fifth grade class and had about almost 50 kids for kids or something. They were in her class and we all wrote a book together. We actually use the time for the workshop to go ahead and just craft out a story and that book is about to be published. It’s called ​The Attack Of The Pickle People. So I share that with you because we’ve done this multiple times. I could tell you some of the other stories. I could talk to you about how my daughter did this when she was seven years old, did this when she was eight years old, when she was nine years old. Just suffice it to say trust me she’s published some books and we’ve we’ve done some marketing to help them become number one bestsellers. And she has a nice little business she’s building on the back end. And we just got back from this workshop today and I thought it’d be cool to use with tool to share with you the strategy so you can do this with your kids or if you’re like my brother in law he said you know what I’m just gonna do this myself he’s got a new daughter and he decided to just start writing these books. And I don’t know if you use exactly our strategies or not but I think it’s going to really be an easy one for you to implement. So first of all this the first thing we teach when it comes to this, is you need to decide you’re going to do it and and believe that you can like Eric you’re talking to your kids that they believe they can do it. When my daughter was seven years olds she didn’t think that any, nobody would ever read one of her books and she didn’t think she had the skill to write a book. One of the share with you today is the strategy doesn’t actually require you to write the book. You don’t have to sit down with a pen or pencil and write. And if you’re wondering well how can you do that because some people call Bologna on that is where I’m speaking to you right now. So you can have your kids or you if you plan your story out, you can speak it out. And this is one of my secrets of how do I read a book really fast is we get really clear about what goes in the book first, that’s the most important part. And we’re talking about that maybe a little bit here, too, but desta, we speak it out. And then we take that route the spoken word and we have it transcribed and put it into the written word, and then we edit it and then you basically and I have your book you know, you’ve got a little bit more work to do than that. But that’s about it. If you can tell the story you can have a down in writing, writing, so I’m pretty it’s pretty exciting to do this with kids because they’re so creative. So first, mom one yeah decided to do it now and believe you can and and have intended to finish. I guess the second thing we teach people is to come up with a reason. Why do you want to bother? Because when you when it comes down to it most people buy gym memberships and they don’t go to the gym. Most people buy golf clubs and they they don’t really use them. They sit in a garage. So a lot of times people start things that they don’t actually ever finish or really attend to finish it just it feels good to buy the book by the course listen to the podcast and not actually doing it. So if you have a look in the mirror and decided to get it done and you understand your reason why it’s going to be tough to finish and and why is going to be tough to finish because you’re going to come into challenges logistically. You’re going to be busy you know logistically. You’re going to have things come up you’re not you’re going to try to upload your book Amazon you’re going to try to work with your kid and start the project and not want to finish you’re gonna get called off to dinner. And it’s going to happen so you’re going to have to make it a commitment to finish and understand that there’s a strong enough reason why. When my daughter and I were making her second book, which she had said, Daddy, I think it will be easier to do it to make a movie. And you can just pull out your phone and really nice video camera and we’ll film it and then we’ll turn that into the book and I was a glutton for punishment, and said yes, and that was really cute. Up until we had to go out in the cold and my daughter didn’t want to and we had to get up early and we to stay up late. And we had to do these movies shoots and we had to figure out how to write the script and we have to get all the costumes it didn’t seem so cool. So honestly, I know that I’m telling you let me give you the couple of secrets to writing a book real fast but these are the important ones or quite frankly, you should just listen to what I’m saying enjoy it and then not do it because if you don’t have ever decided to do it and you haven’t figured out why you’re going to finish you’re kind of screwed. So that’s first couple parts. If you’ve got that handled you know you can go ahead and check that off your list and we can go ahead and get the rest of this going. So the next thing you need to do to write a book is you just gotta recognize that there are parts of the story. So I’ll give you the five parts of a story that my daughter and I use when we’re working with our groups, so that you can figure this out. I give it to him real briefly. So you’ve got it can be very simple, you might want to jot them down, but you can probably remember it to every story is three parts, specifically a beginning, a middle and an end. And so this is something I teach in one of my programs about how do I how do you do the live right as a really great talk or powerful presentation or become a powerful storyteller and keep it really simple. There’s the first act of second act and the third act like that the first act is making the introduction the second act introduces conflict. And then the third one kind of wraps it all up and you’ve got to conclusion. And so that’s really simple in the three part narrative of how do you figure out the story now, when you’re writing kids books, it’s kind of fun to put in a little twist like something different something unique something surprising. So sometimes you plant a seed early on in the story or the good guy turns into the bad guy but to see it at the beginning of the story I’m sorry let me finish that thought plant the seed at the beginning of the story that by the end of those sorry you go oh wow I didn’t know that was going to be the case right? So like in ​The Three Ninja Kitties, the 3 ninja kitties about the second book that my daughter wrote, they went to a dimension on another universe. Like that’s kind of crazy weird. So I guess that wasn’t really a twist but then they found out that we follow the Star Wars, kitty Wars theme. They found out that that that the Emperor was a bad guy, and yada, yada, yada. Like those twists were already in the key or story that we had. But then at the end of the book, what ended up happening is they woke up and they weren’t sure if it was a dream or if it was reality. And then there’s a little thing but like pie in that it really had happened and they traveled in but it was cute. So what’s your twist? Going to be in your story which just think about as being something surprising, something unique. We just wrote a story today, the new book is called priceless. A new story called with the kids that we just did this workshop with, Oh, I got it. It’s the super carrot. And the spy dogs do dot, dot, dot. The kids wanted to call it. So super kids in the sky. So they like the fact that there was a cliffhanger in the title, which I guess is the fifth thing. So giving you three things so far. So we’re not out of whack. Beginning, middle and end. And then the fourth thing is a twist. What’s something surprising and unique? And then what’s the cliffhanger that’s maybe towards the end of the book to get people to want to read the second book, the third book or whatever. So let’s move on. That’s pretty simple. Couple of parts that you want to consider your story that’s beginning, middle end, and a twist and a cliffhanger. And those are the five parts of your story. Now who what else you need in your book? The who the what the why. And the wind? You know, those are really simple. Well, simple for me to say. But now you got to create who, what? Why in right now those are the the brainstorm session about your book do you want to write about this? Or do you want to write about that now we do at our super kids book workshops. And it depends on which workshop this is that we’re leading. But the way we ran this today is everybody yelled out their ideas and almost every idea made it into the story. So it’s just as crazy of a story as you can believe. So we’ve got talking carrots, living fruit and Brett living talking care. It’s talking dogs and cats, cats with laser beam beam shooting out of their eyes. We’ve got dragon and dragons, dinosaurs that come up out of the ground, we’ve got a fish that becomes the mastermind of the whole story. I mean, a lot of weird things came up in this project. And we like to do this at this with the kids because these kids were today they were ages four to 11 and they had a great time. It was lots of fun and this is a story we’re actually going to publish. So a lot of our super kids cook workshops. When we design a book like this, I’ll just take a story. And I’ll do what we do next. Okay, I’ll share with you how we did this. So we brainstorm that was a brainstorming of who, what, why, when, what’s happening, whether the story is what are the beginning, middle end? Who are the characters? What are their names, all of that, and then we storyboard it out. So the big thing here for you is to storyboard it and was a storyboard you might think this is real complicated, you have to look it up online or something, but take a piece of paper, draw some lines on it, and you’ve got like 10, 20 boxes. Each one of those boxes is a given chapter and how you plan what’s going to happen in each chapter. You remember those boxes, one through 10, or one through 20, or whatever you want to do. And now you’ve got your chapters and I start to plan it out. You just start to fill it in. And this is what we did at the workshop today. She filled in the ideas of our story, the brainstorm and then we started at the beginning and we ran it to the end and we just told the story because it’s easy to tell the story. The kids are all excited. They were telling different lines of the story. I’m telling parts of the story. They’re telling parts of the story. And then what we’re doing is we’re recording that. So we take the storyboard and we telephone story. Once upon a time, there was this carrot that opened his eyes and screamed because this giant, greasy pig was about to take a vitamin attack the pig said, and then pick open his mouth and you look so delicious. I don’t even think I’m gonna fry you. I’m gonna put you on a plate and he just like you are and then when he he turned around and came back and he took what to take a bite of the carrot. The carrot, so his whole life flashed before his eyes and he thought, I want to live I don’t want to dive only five years old. I’m just a kid only become a teenager. I want to become a grown up. I want to have a baby care. So he mustered up all his courage and he became a super carrot. Because he had super skills but because he had a super desire super will to live. And when the pig degrees, he pig reach down to take a bite of him. he ducked his head and slipped off the place. And then he slipped the plate and he laid it on the floor. And then he ran across the floor and he jumped out the window really jumped out the window we found all the way down the hill because this was at a fast food restaurants at the top of this mountain, any tumbles and tumbles and tumbles down the hill to the bottom of the Holy Land and something like that is what we told her the first part of the story. I may have gotten a little wrong right here but you see like it just made it we brainstorm that and then I made up what was gonna happen in the story now that can now that that is speaking the story out loud. I will then have that transcribed like I transcribed my podcast like I’m going to transcribe today and then I have my transcription go to a writer or editor. So I’m going to give you the five people that I like. Higher when I’m getting a book done now with super kids books publishing, and I have a program like that for a publishing company for kids and kids, book authors and adults can put in kids, because books as well will help you publish that I’ve got a full service publishing agency. In fact, if you want to find a designer and editor or a writer or things like that, to support you, you just have to reach out to us and we can let you know and I can help you. But these are the five different different things that I hire for to get my book done, I think you should do the same. So number one is a writer, number two is an editor. They do very different jobs. Number three is an artist like a design as what I typically look for. Like, so who’s going to design my artwork, and it might be you and your kids. That’s one thing, but you need somebody to take that art and put it in such a way that it can be digitized and printed. And so you hire an artist to do that. Another thing you hire is a format or somebody’s got to actually format this book and make sure that it looks good on paper and it’s in the right Stay format and everything so they can be uploaded online. And you can make it a real book. And then the last thing we hire for is a publisher, somebody to help you actually just figure out the logistics to get your book up and make it real and actually promote it. And not to mention the fact that you should do some marketing and different things behind it. But to just break this down into the simplest of simple terms, those are the five people you need to hire. I’ve got all those on my team with my daughter, and I have a membership program for kids. And it’s only $27 a month and meaty we have we give them access to our workshops, our course our templates our coaching and how to do it. And then we pick kids every month that we give scholarships to that we help them publish their books as well as they get their stories. So any rate that is kind of it you speak scribe source. The way that I even advise if you’re writing a professional book is that you use these strategies of speak scratch source, oftentimes the spoken word reads better than a you just sitting down at your computer and trying to be real genius and and figure stuff out. So we like to use this process. I have other processes for helping you get your foot down in a month or what I like to do is like the 24 hour book Have you invest no more than 24 hours of your time to get your book done and we’re very strategic about how you spend that time I don’t suggest you try to do that in 24 hours back the back. But you can get it done in a weekend get it done in a week. However that’s to go ahead and make sure we’re being clear here that’s not the kids book a kids book you can brainstorm and a few minutes and you can storyboard it out and you can make it really fun. We did my daughter wrote her 10th book that became a number one bestseller and it’s about her little brother who was just born and my daughter wanted to avoid changing poopy diapers. So the whole book was just a very simple read on each page is a few words on each page but it was about that my daughter avoiding changing poopy diapers and we made it real funny and it didn’t take us more than 30 minutes to create the context for that book. And then when it came to the artist, my daughter did all the artwork at least by pencil and then we hired one of our artists are super kids book publishing team to color eyes it and make it amazing and get it ready for print and we use the same I hired the same people to help, writer, editor, format or designer and publisher and we got all those things on our team. And so we did that and published her book and we did some marketing and we made it a number one bestseller and bada bing bada boom, my daughter is a 10 time number one best selling author. So I hope you got some value from today’s show. My I’ve had some feedback. There’s some people that a couple of my friends that are watching listen to the podcast and watching the videos that we put out like Dude, can you give me some tactical that I can pay attention to that I can apply and I can it would help me in publishing or that it would help me in marketing or that helped me in my sales. I want to know something I can apply right now. Like you know what let me just start picking things so today because we just did the super kids book workshop. I want to give it to you and I would invite you for anybody who wants some help getting this done. Shoot me an email like I need to be different about my call to action here. 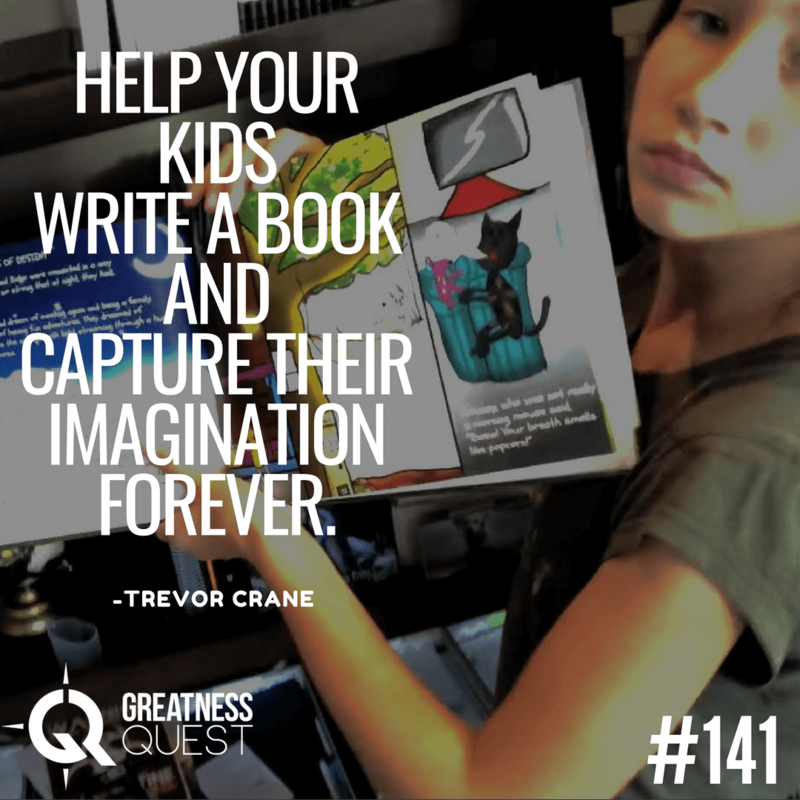 I’ve got an email that comes right to my support team and it’ll get to me if you just shoot me an email and say that you’re interested in kids books are having me help you with it and it send an email to ​support@trevorcrane.com​. This is not some kind of automated system where I don’t know that I’m not trying to trick you with anything is if you want some help. You can also like reply, if you see this on social media, you can leave a message and whatnot and say, Hey, I’m interested and curious? Can you help me? That’s totally cool. But reach out and say you want to help some help with kids book stuffs and we’ll invite you to one of our workshops they’re very reasonable and then we can help you and your kids write a book and you can capture your kids imagination forever. I hope you got some value from today and I can’t wait to see you tomorrow. Cool show is coming up for you. So I hope you enjoy and I’ll talk to you soon.